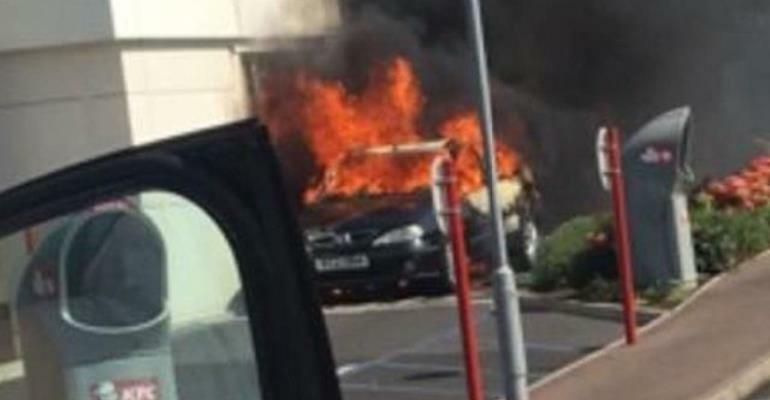 A KFC restaurant has been forced to shut after a burning car rolled up to the drive-thru order window and set the building alight. The burnt-out wreck of a small car could be seen next to the blackened order point in pictures of the aftermath of the fire in Denton, Greater Manchester. Greater Manchester Fire and Rescue Service said it took three fire engines around an hour to tackle the fire after it spread to the restaurant. “Firefighters used three hose reels, six breathing apparatus, one thermal imaging camera and a thermal scanner to deal with the fire and were at the scene for around one hour,” they said. The Manchester Evening News reported that workers at the fast food restaurant had pulled the driver from the car. “The manager and some of the staff ran out and managed to get him out of the car,” a witness said. The cause of the fire was not immediately clear but Greater Manchester Police do not believe there had been fowl play.